Put away all your electronics and head to the kitchen! 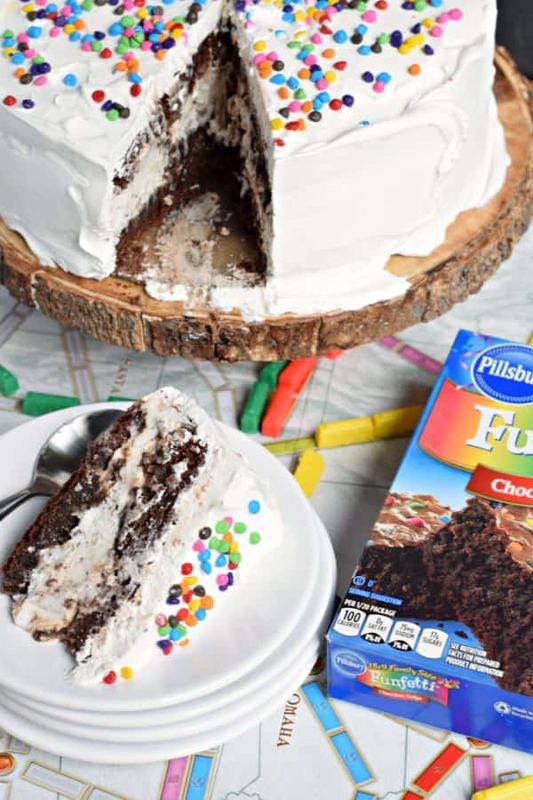 Your family is begging for some of this layered Cookies and Cream Brownie Ice Cream Cake for dessert! As a parent of three teen girls (and a son who is nearly 20), I sometimes feel overwhelmed with all the electronics around us. Between all the TV’s, computers, laptops, ipads, ipods, and cellphones in our house, I feel we can open up our own electronic store! While my kids are good about putting away their devices while at the dinner table, it’s sometimes distracting when they are in their hands every other moment of the day. And I can’t just put the blame on them, as my husband and I can be totally guilty of constantly “checking” our phones! When Pillsbury asked my family to go “technology-free” for one evening, I expected a few grumbles and complaints. 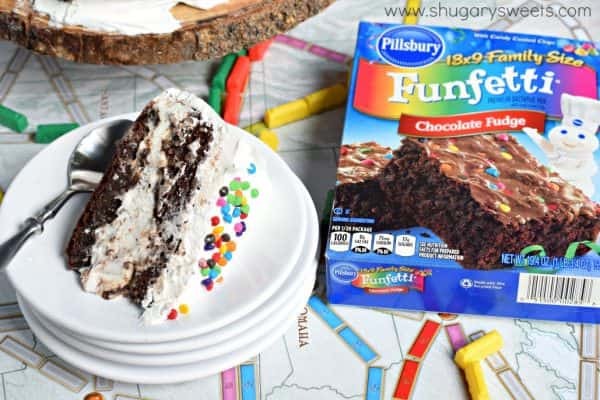 However, we pulled out our favorite board game, and I promised them the most decadent, delicious dessert I could imagine using Pillsbury Funfetti Chocolate Fudge Brownie mix! First, you are going to need to plan ahead a little on this one, as you want it to set up in the freezer for a couple hours. We chose to bake our brownies and get it in the freezer before dinner even started! You’ll want to divide the brownie batter into TWO 9-inch cake pans. I cut a circle of parchment paper to line the bottom so that they wouldn’t stick at all. Once the brownies were done baking and cooling, we placed one of them in the bottom of a 9-inch springform pan. In a small bowl, we mixed up a jar of hot fudge sauce (don’t heat it) with about 16 crushed chocolate sandwich cookies (about 2 cups worth of crumbs). Spread this over the cooled brownie. Next you’re going to add your cookies and cream ice cream. I let it soften on the counter for about 15 minutes (while I gathered my stuff and mixed the hot fudge and cookies). This was the perfect amount of time to soften it slightly. Scoop it out and cover the hot fudge cookie layer (use a whole container, 1.5 quart). Finally, add your second layer of brownie. Press gently to smoosh it all down. Cover with foil and freeze for at least two hours (or more if you’d like). While this is in the freezer it’s the perfect time to enjoy dinner and play a family board game. 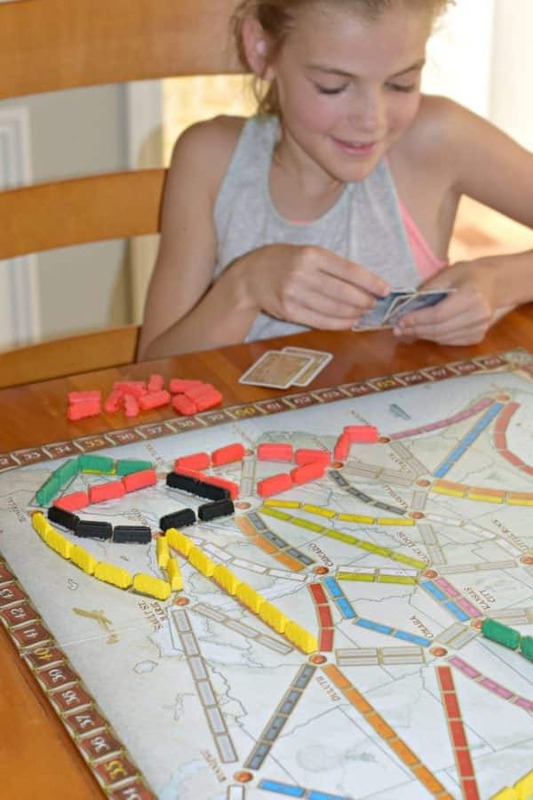 Our family loves games…from cards to board games, it doesn’t matter. I love that it gives us an opportunity to talk, laugh, and make memories! And, without the distraction of technology, we really had a fun night! Once our games were done, we pulled out the frozen brownie cake. We removed the springform pan and covered the cake in whipped topping! The finishing touch was to use the funfetti sprinkles from the Pillsbury brownie mix! There’s no need for a cell phone when you have your hands on a plate of this ice cream cake! 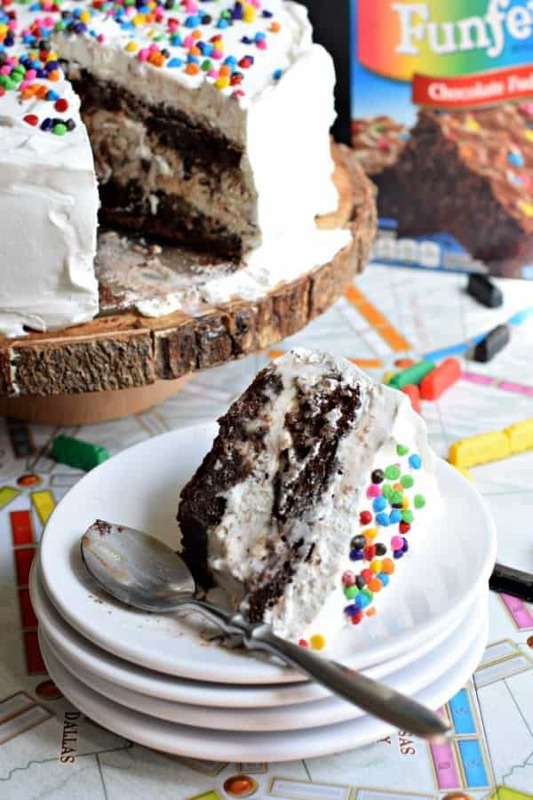 Cookies and Cream Brownie Ice Cream Cake: the perfect dessert recipe! Bake in a 350°F oven for about 17-20 minutes. Remove from pans and cool completely. 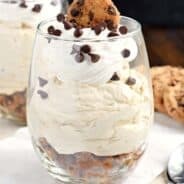 In a small bowl, combine the hot fudge sauce (do not heat it) with the crushed cookies. 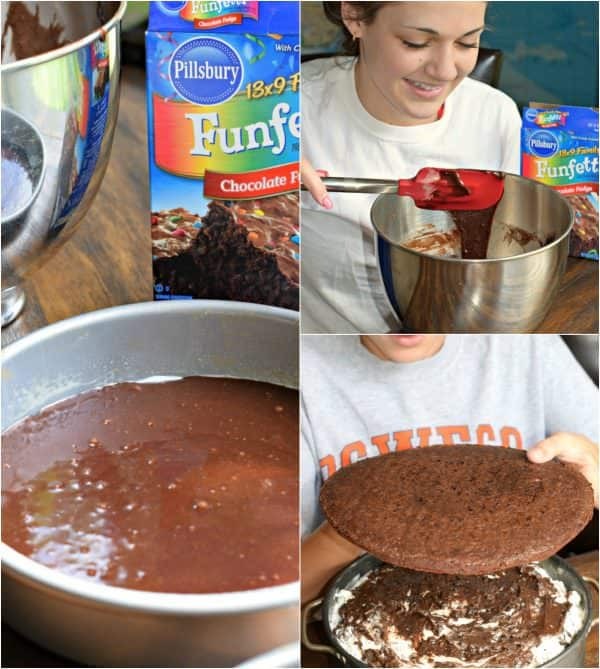 Place one layer of brownie cake in the bottom of a 9-inch springform pan. Top with the hot fudge and cookie mixture. Next, scoop out the cookies and cream ice cream and spread over the top of the hot fudge mixture. I removed the ice cream from the freezer for about 15 minutes to let it soften slightly for this step. Finally, place the second layer of brownie over the ice cream and cover with foil. Freeze for about 2 hours (or more). When ready to serve, remove the springform pan and cover the cake with the whipped topping. 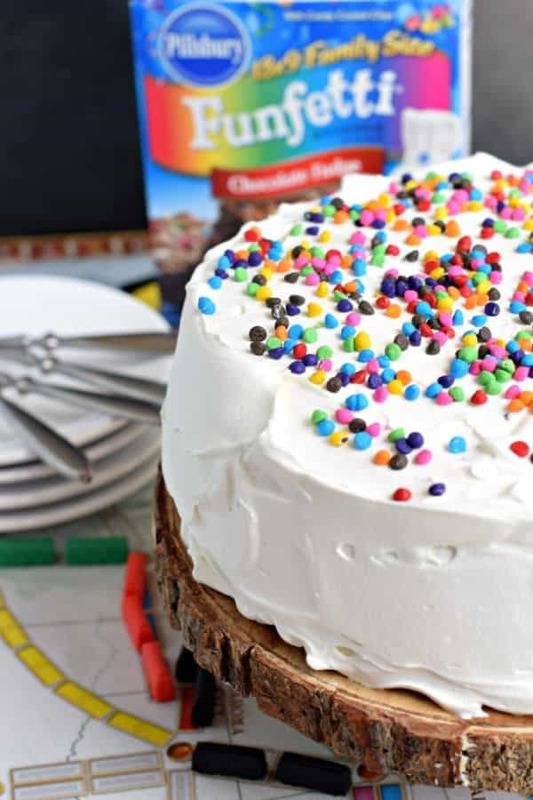 Add the reserved funfetti sprinkles from the brownie mix to the top of the cake. ENJOY. 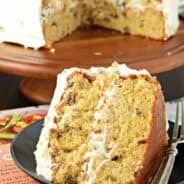 Store remaining cake, covered, in the freezer for up to a week for best flavor. We go tech free every weekend for a day. It’s nice, even though I think we all itch to check our phones. But family bonding is pretty neat! And this cake is awesome. I want to inhale it all! Love how fun and festive this is! My kids would go absolutely nuts for this fun cake!! Wait. 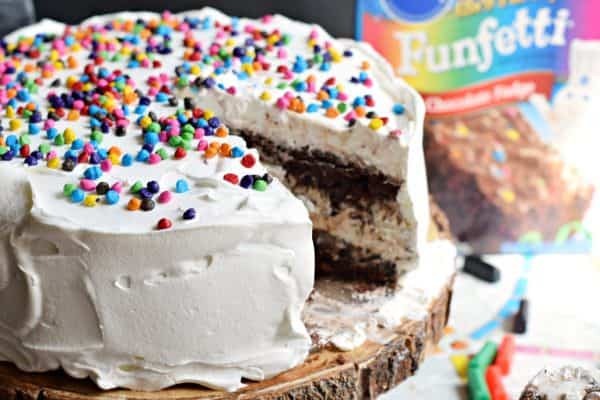 Funfetti brownies exist?! 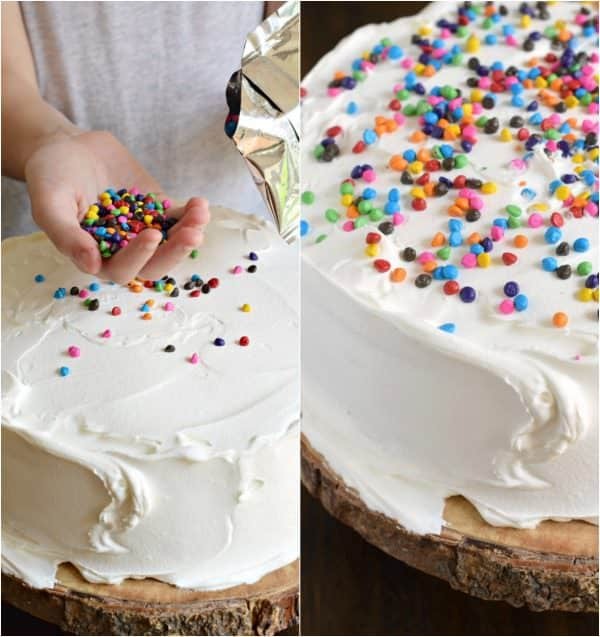 Funfetti cake is my LIFE….so I NEED THIS. Can I have a few slices…for breakfast? This looks so fun! My granddaughter will love making this with me! I would totally trade my technology in for this cake 🙂 I also had NO idea Funfetti brownies were a thing. What a glorious revelation! I don’t think there is anything that could make this cake even better. 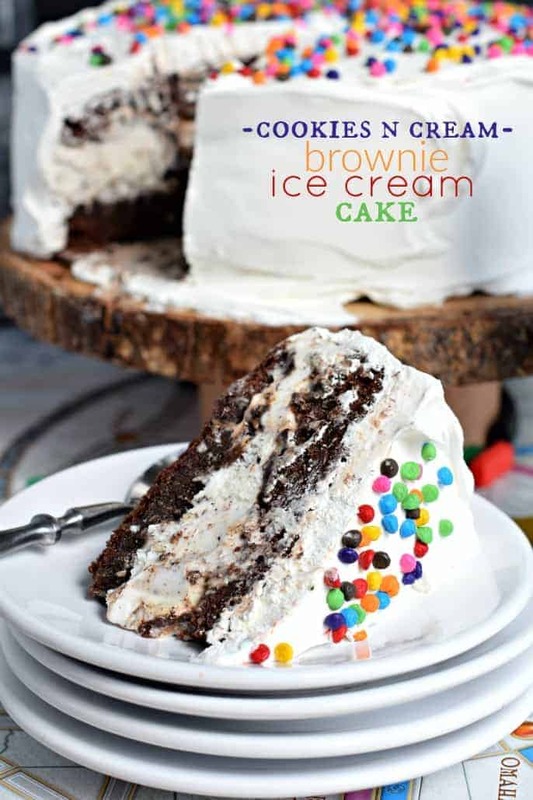 Combining brownies, ice cream and cookies and cream in one cake is perfection! What game is that you are playing in the picture? We also love games and are always looking for new fun ones. my kids would happily put away all electronics for this dessert!! Brownie ice cream cake is the only way I could go no technology!! LOL This looks divine! This looks soooo fun and delicious! 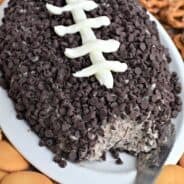 Love this cake, cookies and cream are two of my favorate things, so i know i would love this cake, my children will love this. Thank for sharing! Did you have any trouble cutting the brownie after being frozen? Just made this cake for my family. Made a few changes. Baked half a f the brownie mixture in greased 9″ springform. The other half in round 9 ” pan greased and lined with parchment. I layered the cake differently. On top of brownie in springform pan I put half of the cookie chocolate mixture, followed by half of the ice cream. Then the other half of the brownie from the round pan. Repeat remaining chocolate cookie mixture and then rest of the ice cream. When serving I let people add their own “squirt” cream and sprinkles. Young and old had fun making their own. 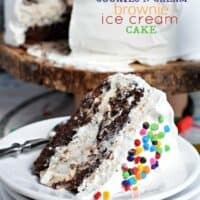 My daughter in law says it’s the best ice cream cake I’ve made! !